I will try to put updates after the fight.. Since I am seeing that this post is also being shown in SERP. I have seen lots of bloggers are now optimizing for the Manny Pacquiao vs Oscar Dela Hoya Fight Results, Well this post might be late already knowing that there are lots of of bloggers now focused in optimization the fight. This blog has been consistent in the top first page of SERP for the previous fight of Manny Pacquiao and since I don’t think I can make it on top this days because of the busy schedule let me give some insights and tips on how to optimized this fight. First you can check my E-book where I detailed on how to earn from the current events. But If you finished reading that e-book perhaps your my regular reader here. I believe that below keywords will help you earn some money during the fight. So I have given you the idea on what keywords you might optimized , so why don’t you try to do some keywords building in your post. BTW you may still edit your post and add those keywords mention above and it will be updated from the SERP after it crawl back to your website. I still don’t know why some of the fresh post is not showing in the SERP even I tried to copy the exact phrase in my Title. Does anybody experiencing like this. BTW I have check some big site and I have seen that almost all site’s fresh post page have unranked PR , I still don’t know the explanation. Maybe some of you knows. Anyway happy optimization in your Manny Pacquiao and Dela Hoya Fight. great list of keyword for the seasonal topic..
otherwise their SEO effort eh masasayang ng konti dahil sa pag down ng server. i have posted an entry many weeks ago. and i’m getting plenty of traffic from the keywords i chose in my title. i can’t post about online video or streaming, as i don’t have anything to offer for the readers. Its true… Properly placing your keywords (plus making several posts) will most likely land you on top of the SERP’s. But sa mga bloggers tulad ko na most of the time tinatamad, mga ambon nalang ehehe.. Btw, congratz bro sa Award mo. More power! 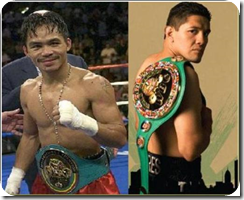 have seen lots of bloggers are now optimizing for the Manny Pacquiao vs Oscar Dela Hoya Fight Results, Well this post might be late already knowing that there are lots of of bloggers now focused in optimization the fight…. Yes, optimizing your keywords really help SERP. But for the record, PR is not related to SERP as the latter depends on how you build links. But don’t worry, PR is a status symbol only and does not necessarily mean traffic. It’s for increasing the chances of getting advertisers to your blog, though. I read that through top webmaster forums like DP and SP. ” PR is not related to SERP as the latter depends on how you build links ” I would like to dis agree.. But it should be .. ” PR is one of the hundreds of the basis for the SERP ” . We cannot really disregards the value of PR in SERP but we cannot also say that because of PR you will be on top of the SERP. Google algorithm always changes and it is only them knows the latest Algo. But one should not loose hope if they don’t have PR. I agree on the factors you mentioned. However, I think it’s just a misconception when bloggers are more focus on PR instead of SERP. The two are being misunderstood many times. SERP brings organic traffic, while PR is a symbol although maybe can help somehow…peace! Ha ha ha.. It is always peace Angel.. Yup I agree they are always misunderstod .. with each other.. because some are thinking that they cannot top the SERP if they are PR0. Well in fact they can. thanks for the information. I will use the keywords above. I will make the post this week and will keep you updated on my rank in the SERP..
Google has indexed my blog again.. I get to see some posts being indexed in as fast as 10 minutes na ulit..hehehhe.. I hope to get a good rank..hehhe..
ladys last blog post..Nokia’s BH 840- Smallest Bluetooth Headset! Maganda yung CNN trick he he he 🙂 , Medyo busy ako ngayon kaya nag suggest na lang ako .. maagang papasko para sa mga reader ko..